A group calling for better working conditions at Walmart is criticizing a food donation campaign for employees in need, saying it's symptomatic of wages being too low. But Dawnne Sulaitis, the Walmart department manager who started the campaign for "Store 3430" in Midwest City, Oklahoma, said it's "about showing compassion for others." Last year, the Making Change at Walmart campaign highlighted a similar food drive in a store in Ohio, describing it as a result of pay that was too low at Walmart, the biggest employer in the country. "I understand there's quite a bit of unfavorable media regarding this food drive," said Sulaitis, a 19-year Walmart veteran. "I haven’t even read it, and I’m not going to read it. Our intention is just to help our neighbors and our friends. These are friends who need a helping hand." Full-time Walmart employees in the U.S. are paid an average wage of $12.92, according to the company, which employs more than 1.3 million people at more than 4,800 locations in the country. The average starting wage for Walmart's sales associates is $8.81 per hour in urban markets, according to IBISWorld, which translates to annual pay of $15,576, based on 34 hours of full-time work a week. A Walmart spokeswoman said the donation efforts are not organized by the corporation, but by store employees. Sulaitis, 54, said she approached the store's human resources department about two weeks ago to ask if there are any fellow employees in need. She was then told that two employees, who remained unnamed, had taken an extended leave of absence, and each were single-income households. "I asked if we could do bake sales to raise money to help provide them with a Thanksgiving meal and to put together a food drive in which associates in the store can contribute to their meals," Sulaitis said. 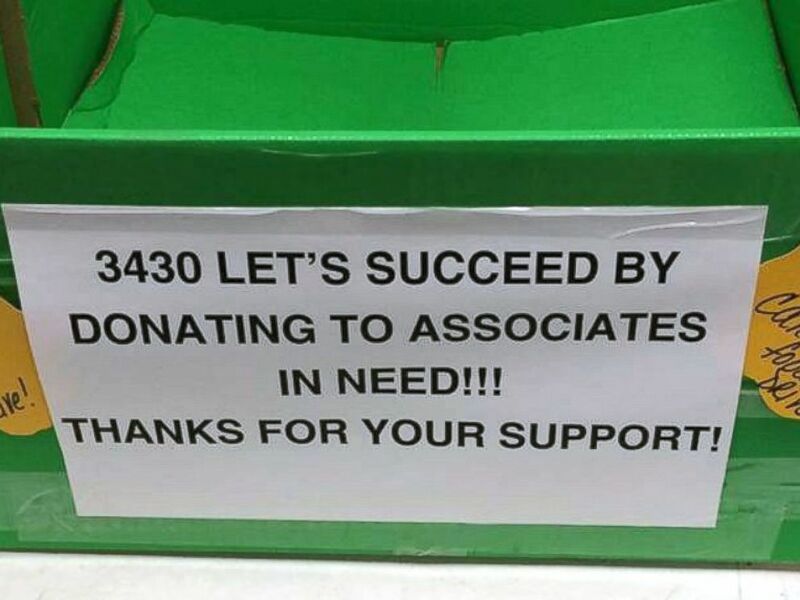 "So we are acting collectively to help out our fellow associates." There are more than 300 employees in that store, which is located in the outskirts of Oklahoma City. 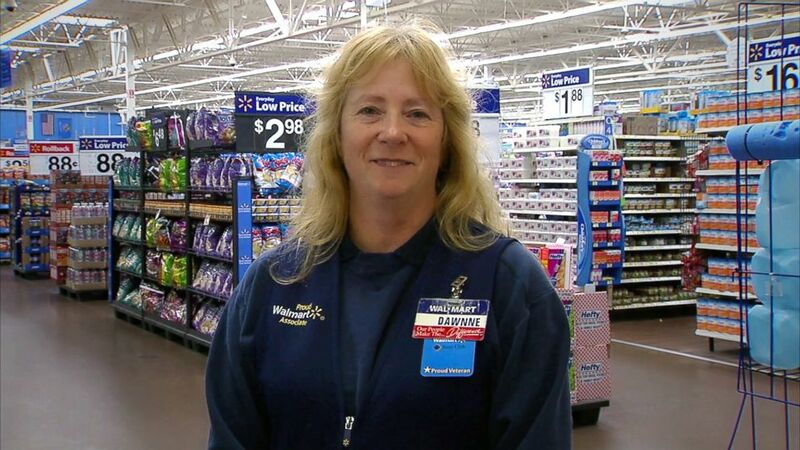 Allison Livengood, an associate of four years from Oshkosh, Wisconsin, who is part of Making Change at Walmart, said in a statement, "Walmart workers care about each other, there's no question about that. But it doesn't change the larger problem that many of us are unable to cover groceries even though we work for the richest family in the country. The Waltons have to open their eyes to the fact that Walmart’s low pay is forcing workers and our families to rely on food stamps and food banks to put food on the table, and even that's not enough. Walmart and the Waltons must raise pay and provide full-time hours."